Psalms 112:1 Praise the LORD! 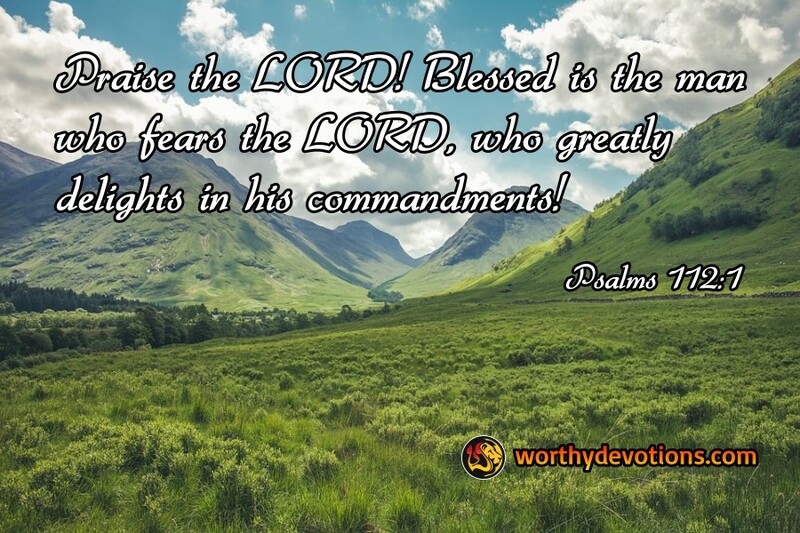 Blessed is the man who fears the LORD, who greatly delights in his commandments! There's nothing we can do to earn God's love, however, if we want to experience His blessings we need to observe the qualifications that He's given us in His Word. Psalm 112 details a whole list of blessings, but the key to receiving them is verse 1. "Blessed is the man that fears (puts his trust, honors, in awe of His majesty) the Lord, and delights greatly in His commandments. (Takes pleasure in what God says and obeys Him)." Adopt that attitude toward Him and be assured, blessings are on the way! Your offspring will be mighty on the earth (vs 2), wealth and riches shall be in your house (vs 3), even in darkness the light shall shine on you (vs 4), you shall not be shaken (vs 6) in the midst of evil you will have no fear of bad news because your heart is set upon Him (vs 7). Now I don't know about you, but I want to live in the blessings of God! Let's live a life that God will bless, honor the Lord with our whole heart, and delight in obeying Him! 1 Praise the LORD! Blessed is the man who fears the LORD, who greatly delights in his commandments! 2 His offspring will be mighty in the land; the generation of the upright will be blessed. 4 Light dawns in the darkness for the upright; he is gracious, merciful, and righteous. 10 The wicked man sees it and is angry; he gnashes his teeth and melts away; the desire of the wicked will perish! The new movie "Greater" is a prime example of this Psalm in that it shows how a man who keeps his eyes on the Lord and quietly endures the scorn and persecution of the wicked and sinners who have strayed from the righteous path. I also recommend another movie out now called "Remember the Goal" which also goes along with this passage. Thanks for sharing this encouraging word, George Whitten.